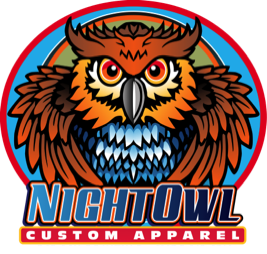 NightOwl Custom Apparel is a full service screen printing and embroidery shop, offering excellent in-house graphic design and stitching digitization. With over 25 years in the industry, we are fully equipped to supply you with quality decorated garments, very quick turnaround,and reasonable pricing to keep your project within budget. 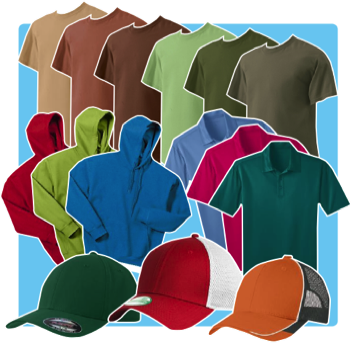 Whether you need tees, sweats, polos, bags, or hats with your logo printed or stitched, we offer all of the major garment manufacturers, such as Gildan, Hanes, and American Apparel, all at a fair price. We will work with you to get the image you want to come across, whether it’s professional or just for fun. You may need employee/team uniforms, business promotional giveaways or event mementos- we can make you look great! Just email shelly@nightowlcustomapparel.com to get your project started. NightOwl can supply you with storefronts to aid in sales and distribution for your group. With minimal setup charges, NightOwl will develop simple sales page, featuring many styles of garments, to take orders and ship to individual customers. This makes it much easier to collect orders from members of your group without the hassle of a coordinator making sure to contact everyone. We do all the hard work for you! Check out some of our currently open stores below to see how we can assist you and your customers or group.